What better way to celebrate the opening of a new school than by performing a fanfare in its honour? Four classes at Crown Meadow First School did more than that . . . they actually composed their own fanfare alongside City of Birmingham Symphony Orchestra musicians and Worcestershire-based composer and radio/TV presenter Tommy Pearson. 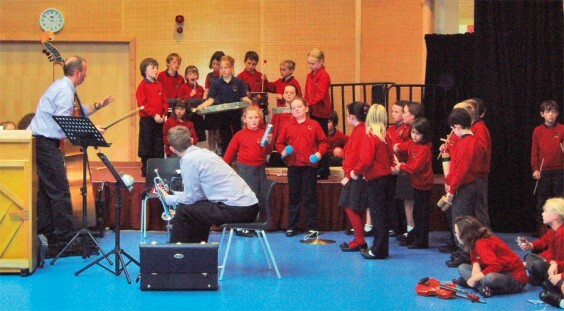 Early in the autumn, each class took a particular aspect of their school which was special to them and started to put their ideas into music, with a little help from the CBSO professionals. Tommy, a film music specialist and well-known radio and Proms presenter, developed some themes with the children: Getting Up, A School Day, Forest School, and … A Trip to Outer Space (well, why not). He was able to use ideas emerging in the classrooms (and the outside classroom of the Forest School) and absorb them into music for CBSO musicians to perform, seamlessly leading in and out of the sections of music composed and performed by the children. Even the state-of-the-art electric roof blind in the school hall played a prominent part – the dawn of a new day, with light gradually flooding the hall to signify a sunrise. “The children understood the concept immediately and I loved the enthusiasm they had for playing their instruments and creating new ideas,” Tommy told us afterwards. “It was often a challenge to keep them all under control but 120 eight and nine year olds, each with a drum beater in their hand, was always going to be a noisy experience. “The final performances were very special and a huge challenge for the children. In effect, we performed the whole piece, about 40 minutes long in total, four times in one day, but all the children were brilliant, performing their pieces perfectly and always concentrating hard. “I was absolutely delighted with the piece; the children were superb, their pieces imaginative and inventive, and it was one of the most moving and satisfying projects I have ever been involved in. A moment to remember,” he added. Susan Reeve, Arts Co-ordinator, said: “The children particularly enjoyed being part of the planning and writing experience, and were tremendously excited about being in a proper performance. “It was super to have these world-class musicians in our school. Obviously they are inspirational people to have around, and we are very grateful to the CBSO and their players. “They developed the project further for us, so that the younger children could visit the CBSO Centre for a concert. Also they brought the Little Big Time Band into our school hall, which was lots of fun. * The David Morgan Music Trust and its trustees provided very generous financial support to enable Crown Meadow to experience the Fanfare project. This fund was created by the late David Morgan, who was a teacher, Bromsgrove District Councillor and supporter of Bromsgrove and Barnt Green Choral Societies and Bromsgrove Festival. For more information about the trust, see http://www.davidmorganmusictrust.org.uk.